It took me many years to understand the importance of maintaining a routine for healthy skin. Now that I am getting closer to my thirties I am starting to see things change on my face, body and even my hair. I use to laugh whenever I received a free sample for some wrinkle cream or other products that I just associated with much older women. I honestly didn't realize how soon I would need those types of products but I have started to take much better care of myself on the outside just like I have on the inside. 1) Diet- Eat fruits rich in color that are full of antioxidants like Blueberries. Red, yellow and green vegetables. Fish full of omega-3's is also beneficial. Avoid salty foods because the sodium will retain water in your body. Try to not overdue alcohol and caffeine as it will dehydrate you. Most importantly, drink plenty PLENTY of water. You should be consuming at least 9 cups a day but really water intake varies from person to person so looking up a calculator might be beneficial. This summer has been a lot of fun so far. Even though I have not gone on vacation at all this summer I am still enjoying the warm breeze, pretty flowers, squirting my kids with the hose and just being able to get outside to get some fresh air. I started my weight loss journey in June (20lbs lost so far!) and I have been trying to capture as much as I can with my iPhone. I am not the best photographer by any means but I'm learning and I have even been using picmonkey as a photo editor which has been fun. A few weeks ago, around the 4th, my children went up north with my parents to the cabin so my fiance and I decided to travel back to his home town a little over an hour away. We got together with his aunt and played some disc golf at a course that I had never been. It was so beautiful there, there was a lake, hills and flowers I knew I just had to capture some pictures. Unfortunately my Instagram wasn't working very well because a lot of the pictures I took had apparently failed to load and was delayed in informing me =( but anyways I wanted to share a couple that I managed to keep and edit on picmonkey. 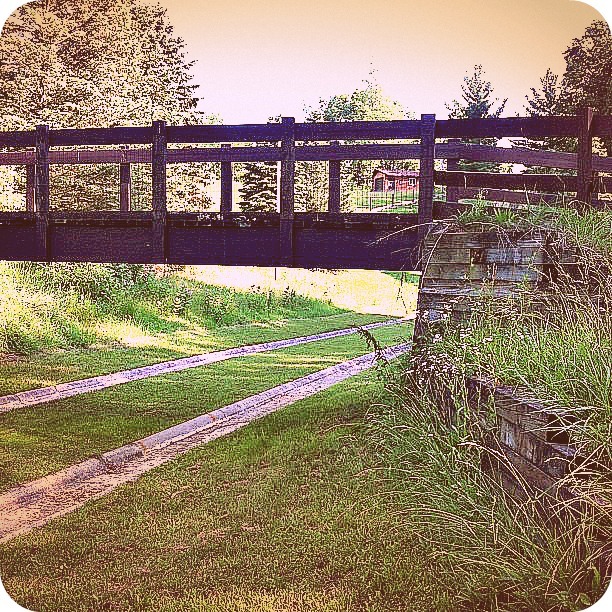 This is the bridge that goes over the toboggan run. I would really love to go here again in the winter to try out this toboggan run because it looks like a lot of fun. Even though I know what I purchased I still get all excited like a kid on Christmas morning. I had ordered a few things from ULTA and BH cosmetics and I was so excited to see the mailman carrying both packages up to my door. 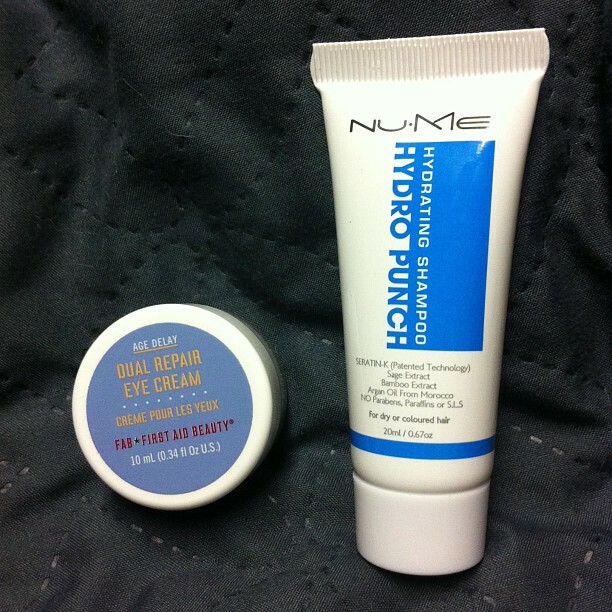 I purchased these items with the discounts given to Ipsy subscribers. 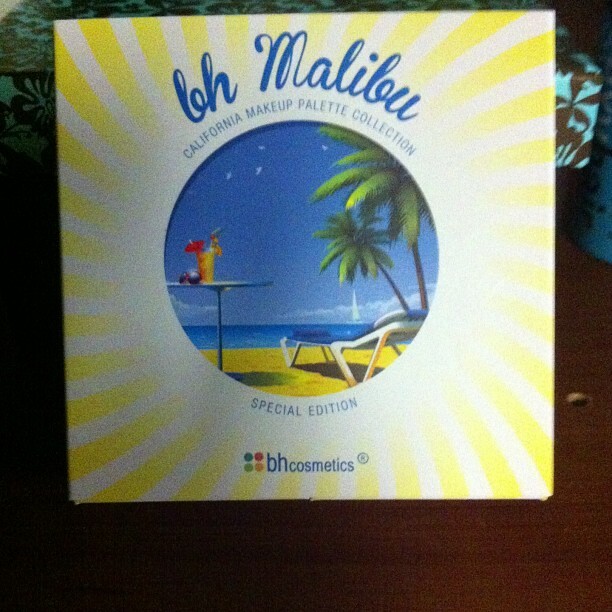 First thing I purchased was BH cosmetics Malibu palette. It retails for $17.95 but with the discount of 51% it is on sale for $8.95 plus there is an additional 10% applied bringing it down to $7. So after applying my Ipsy discount it came to $6.30. That is an $11.65 savings!!!!!! I love the colors in this palette and since I am a "sort of" makeup virgin I am really excited to give these colors a try. If you want to check out the other palettes you can go HERE . I know I mentioned this on a previous post but I wanted to update and share with everyone the products that I had purchased recently. I actually got these last week but I wanted to give it some time to test the products out so I can share my take on them. So here are the two products that I had received. So I have to admit........ I am a freebie addict. 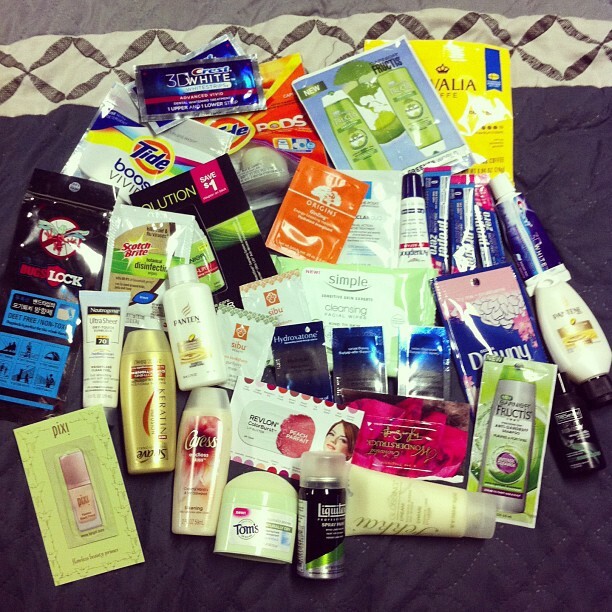 I have spent a lot of time searching for free products using freebie sites. I am a fan of a few pages on FB, I use to be a fan of a lot but they pretty much all post the same stuff so I downsized to de-clutter my news feed. 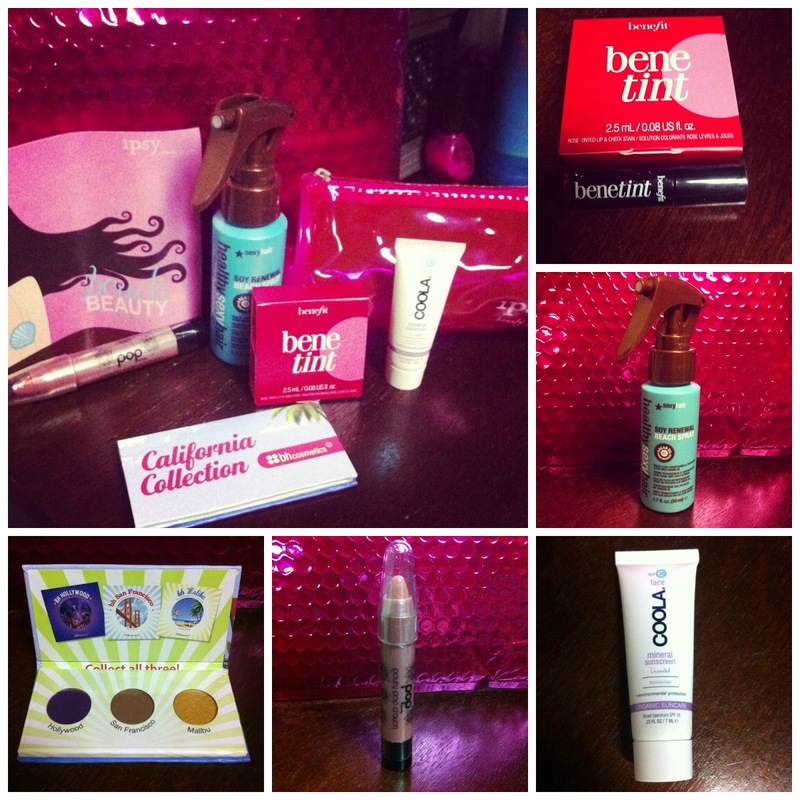 I am so bummed that I haven't taken a picture of all the freebies I have received because I have used a lot of the samples but I did manage to snap a pic of freebies I have received over the last two months or so. Alright so I have a confession to make!!!!!! My make-up bag consists of foundation (liquid and powder), black eye-liner and some eye shadow. I pretty much blow dry my hair hair and straighten it daily, which is bad I know. I don't dye my hair much anymore and in fact I think it has been over 6-7 years since I have dyed my hair. I am 27 going on 28 at the end of August and I am starting to see grey hairs =(. This is one of the reasons why I decided to subscribe to Ipsy. I only pay $10 a month to receive deluxe and full size products to try which is awesome because this way I get to test new products that I may not have bought in the store since make-up can be pretty expensive. Ugh ok so I know I may have had some sort of negative feedback about the Soy Renewal Beach spray BUT I have to admit that it has really grown on me, I almost finished the sample bottle that I received so I decided to buy some more but this time it will be a much bigger bottle. I am so excited to announce that my Ipsy bag arrived today!!!!!! I was starting to go crazy refreshing my yahoo hoping to see a new email from Ipsy giving me my tracking info. Well that never happened but instead I headed upstairs to see the pretty pink envelope sitting on the dining room table. My eyes lit up instantly, I was so in shock I guess because I didn't tear through the packaging right away. Instead I got my camera ready on my phone to start taking pics lol. As promised I received everything that I was suppose too on my glam room page which I had previously posted. This months theme was called "Beach Beauty". I don't know how many of you have ever heard of this site Little Black Bag but OMG it's sooooo addictive. Basically you sign up for free, set up your personal profile and go shopping!!! When you find something you like just put it in your cart to checkout and the stylists will choose 1-3 other items based on your personal style. After checkout you can swap those items online with other members and all the swapping happens before anything gets shipped. Then your items are shipped after the trading is done or when you click to have your purchase shipped. I am still fairly new to the site so I am still learning how it all works but if you want to discover the site for yourself feel free to click the link that highlighted in pink above ^^^^ This site has everything from handbags, makeup, accessories, jewelry, shoes, make up and hair products from 100's of brands. Also if you are interested in getting 25% off your purchase go ahead and click here for the code. So I received a small sample of these Kiss nail dress's in one of my cosmo magazines awhile ago and I didn't show any interest. Fast forward to a couple weeks ago I had been reading some reviews on them on influenster and I remembered that I had the sample of 5 different designs and I decided to just go try them out for myself. Since I only had 5 different designs I just picked a nail that i wanted to use 1 design on and painted the rest of my nails a complimentary color. I must say they turned out fantastic and I had received so many compliments that I went out and bought a few more designs.